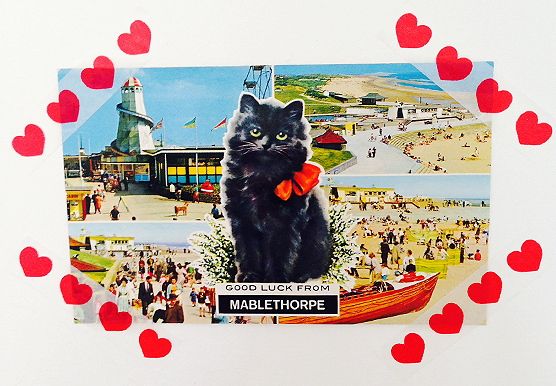 A kitsch black cat postcard to bring you luck from Mablethorpe. Hands up who loves going for a dig around in their parent’s loft whenever they visit home? Sadly my parents no longer live in my childhood home and when they split up didn’t keep much at all. Sometimes I think that’s the reason I can easily part with my thrifty finds, I don’t tend to have the attachment gene to objects or stuff, which is a good thing as my shop would always be empty and my flat fit to burst! On the bright side, my boyfriend’s parents seem to have kept everything and we discovered this fantastic souvenir postcard in one of my boyfriend’s school books. We carefully removed it from the page and my boyfriend said I could keep it and you know what, I’m really enjoying the feeling that I want to cherish a little find from the past. What treasures have you recently found in your parents loft?